NEW Adventure Colors + Sea Glass STYLE INK PADS AVAILABLE NOW! They are single-color, water-based, dye ink stamp pads with a sleek magnetic closure and larger in size than our previous pads. They are currently available in these eight colors. (Our other colors are to be released in this new style in the next few weeks.) They are truly wonderful and that magnetic closure is DA BOMB! You can order them by clicking here. Let me know if you have any questions. I have them and love them! Welcome to this week's Heart 2 Heart Challenge entitled, "Adventure". You can interpret it however you choose as long as you incorporate Close To My Heart products in your artwork. I chose to make a card using the Adventure Fundamentals paper pack and the adorable stamp set, "Sweet Birthday". You can see the fun, bright and whimsical colors and patterns in this paper pack. I love it! I colored in the images with ShinHan markers and attempted to show you, in the photo below, how I added some glitter using the Shimmer Brush pen. It is such a fabulous product! I hope your week is off to a great start and that it only gets better. We look forward to you linking up to us at Heart 2 Heart. I kept this card simple to draw attention to Sea Glass. I random stamped the roses from the stamp set shown below and used a pencil eraser to create the polka dots. 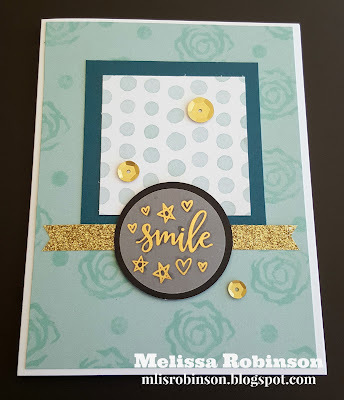 Always needing to add some bling, I added Gold Shimmer Trim, Gold Sequins, and this beautiful, gold embossed sentiment from the "Good Life Complements" (also shown below). I love the versatile images of this stamp set, "With You". It is perfect for welcoming in the Fall but can also be used well beyond that and for many occasions. Check out these fabulous and colorful "Good Life" Complements designed to coordinate with the Adventure Fundamentals paper pack. I LOVE the bright colors and these gold, vellum embellishments...LOVE THEM! 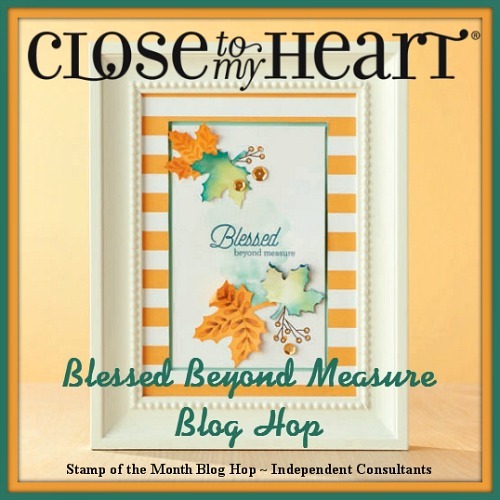 Consider linking up to us at Heart 2 Heart so we can see your fabulous artwork created with CTMH's Sea Glass. 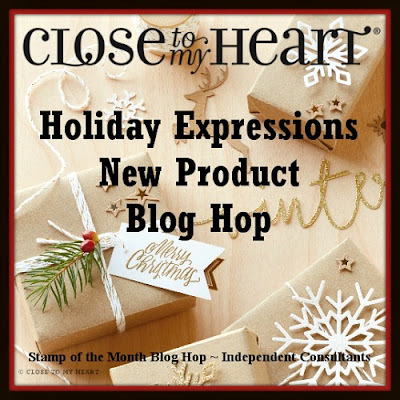 We are featuring new product that was released in our Holiday Expressions. It debuted September 1st and contains Halloween, Fall, Christmas and Winter-themed paper! It is full of fabulousness! You can click here to view its contents online. I used the patterned paper from City Sidewalks, and made a banner out of Peacock cardstock. 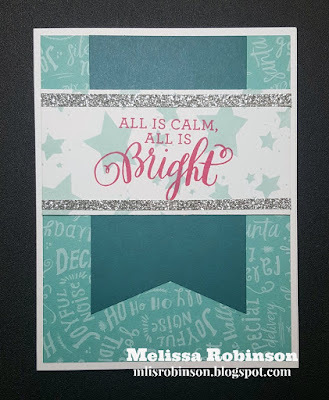 The stars were random-stamped with Glacier ink using "All is Bright" stamp set. 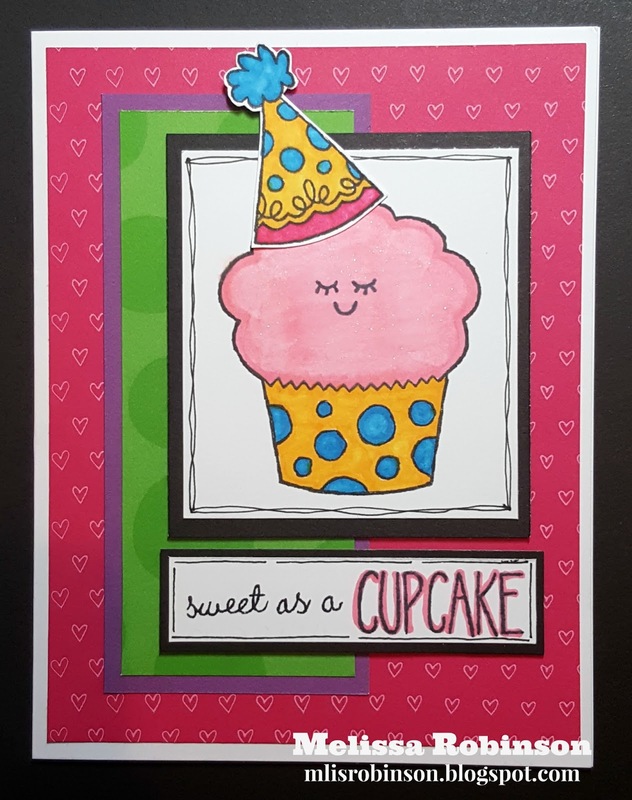 The sentiment was stamped in Raspberry ink and I, of course, had to add some Shimmer Trim to finish it off. 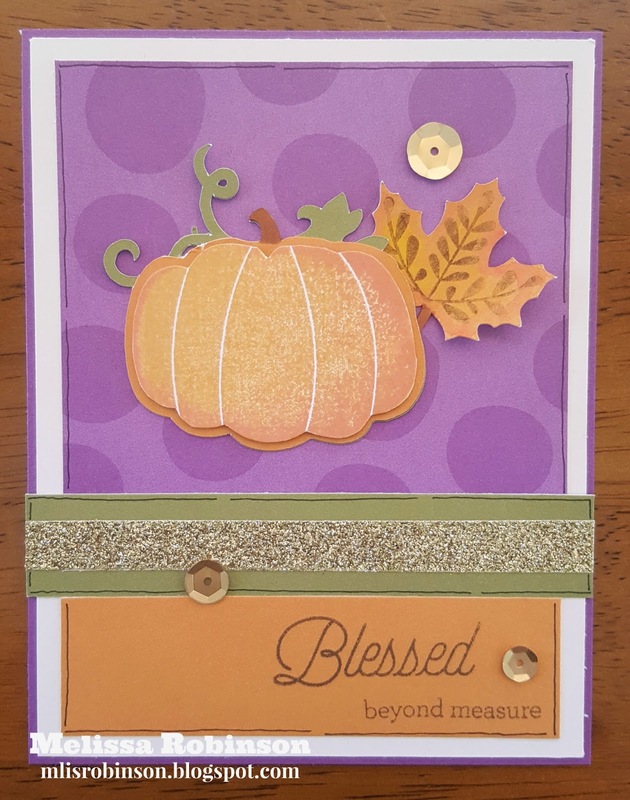 I absolutely love how this card turned out. I hope you like it too! 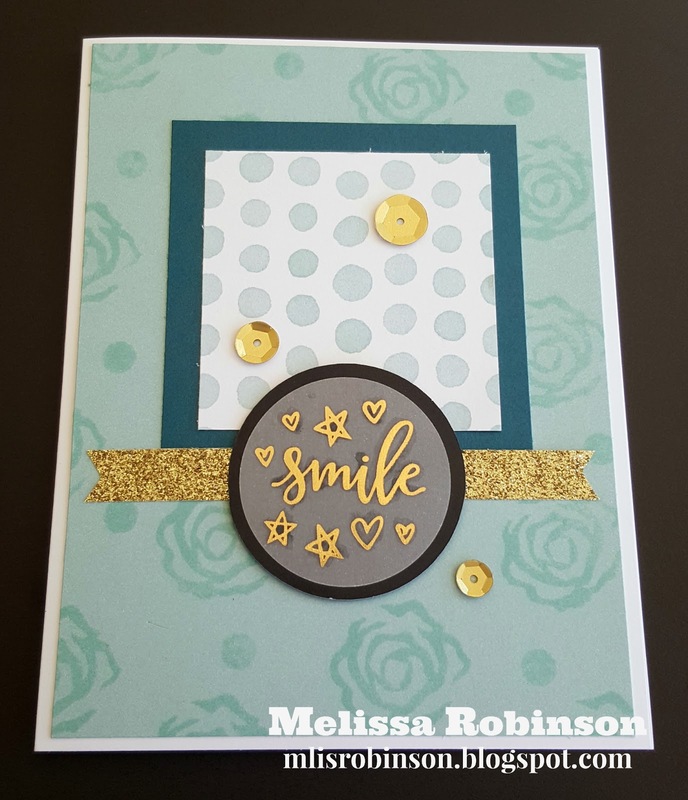 Head on over to Melinda's Blog to see what she has in store for you, using some of our brand new products. 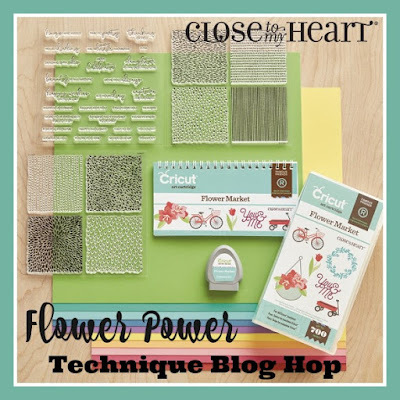 This month we are showcasing the new "Flower Market" Cricut Collection that Close To My Heart released August 1st through our "Flower Power" Technique Blog Hop! The cartridge has over 700 fabulous new images. You will definitely want to add it to your Cricut library. If you are coming from Tonya's Blog, you are on the right track. you can find a complete list of participants at the end of this post. The flower petals were cut out of Glacier and Crystal Blue cardstock while the leaves were cut out of Canary and Fern. They were simply glued together and a little Liquid Glass was applied to the flower center. 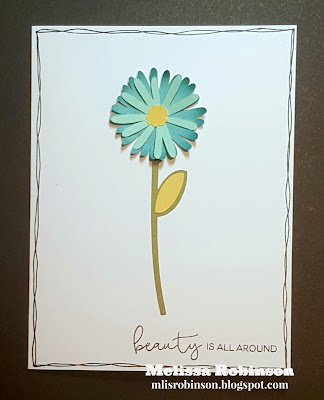 "Beauty is all around" is just one of the many sentiments that is included in one of the stamp sets included as part of the collection. 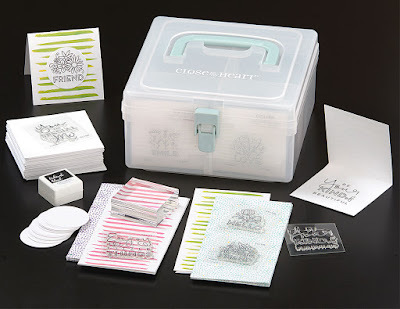 You can find complete details about this Cricut Collection by clicking here. Did you know there is a digital option that is available at a lower price? Have fun checking out all the fun artwork using this cartridge. 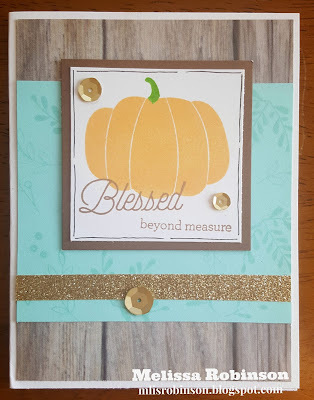 Head on over to Darlys' Blog to see what she has created. Welcome to this week's Heart 2 Heart Challenge where we are focusing on "Create Kindness". Close To My Heart has a fabulous campaign this month that serves as a great "Stamping Starter Kit" and is titled "Create Kindness", the premise for this week's theme. However, you have the opportunity to interpret the theme how you choose. I am sure you are with me in that there is definitely a need for more kindness and positivity in this world. Let's help generate it! 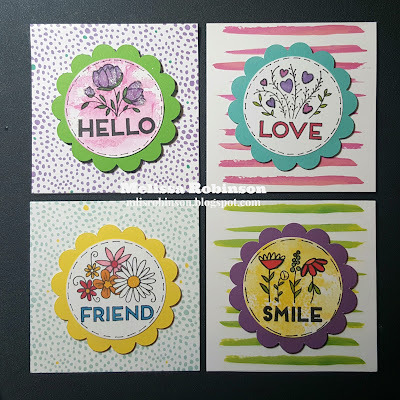 I incorporated the card bases, circles and stamp sets, to create these cards. 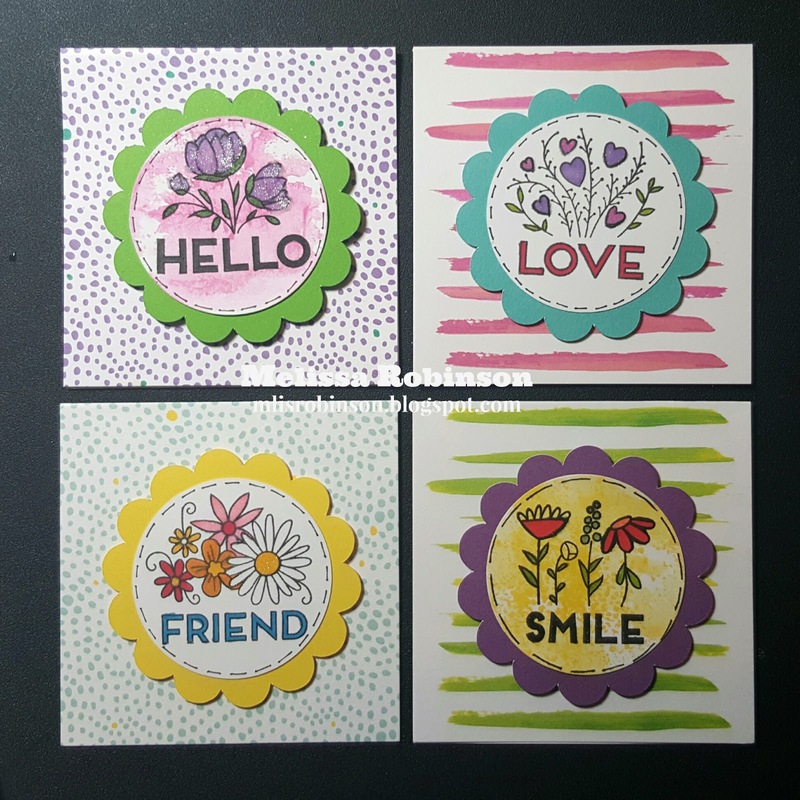 I cut these 2 1/4" scallop circles out of the Art Philosophy Cricut cartridge which provided for some fun layering. A little bit of stitching around the edge of the circle, with the Journaling Pen, and watercolors and ShinHan markers for the focal points... These were the results! I so love them and hope you do too! At this time in our world, maybe now more than ever, there is a need to create kindness and we have the opportunity to do so with this fabulous campaign. You can read more about it here or contact me with your questions. I'm looking forward to distributing these as Random Acts of Kindness. Have a blessed day and week...wherever you are! 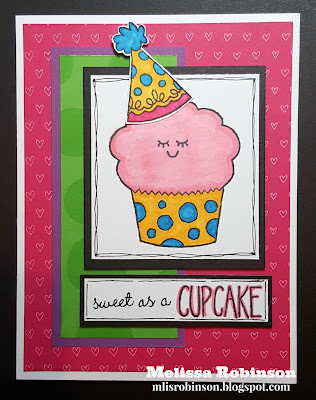 Thank you for joining us for our Blog Hop where we are celebrating National Stamping Month! Gotta love a reason to create, although...who needs one?! We have a fabulous campaign that helps us "Create Kindess" and you will love all that is included in this exclusive kit, including EIGHT MINI STAMPS! Click here for complete details and watch this video for more details. This world definitely needs more kindness and you can help provide it! If you are coming from Cat's Blog, you are on the right track. You can find a list of participants by clicking here. 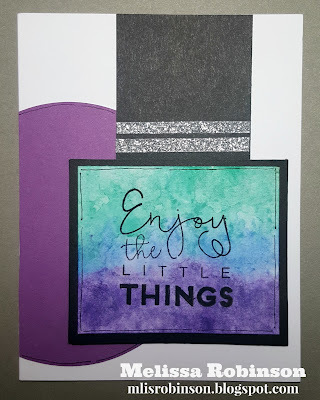 I used one of the stamps included in the Create Kindness kit for the focal point on this card and incorporated watercolor as a technique. A girl always has to add some bling, doesn't she?! Thanks for stopping by. 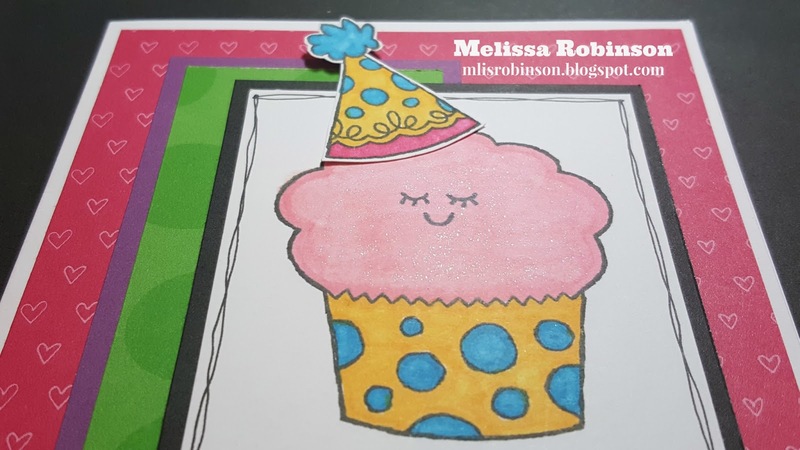 Now please head on over to Melinda's Blog. 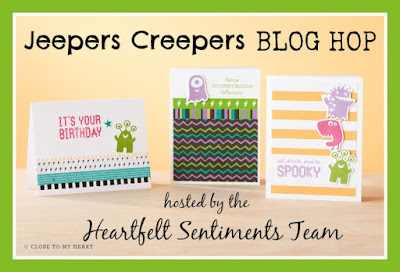 No doubt you will love what you find on her blog. Welcome to our Blog Hop where we are featuring artwork incorporating the Jeepers Creepers paper pack that was newly released on September 1st. I love the ability to use the product line beyond Halloween. Here is the card I made and...I must draw attention to those eyes! Aren't they too fun?! They are included in the Jeepers Creepers Assortment, which also includes the enamel stars. Thank you for stopping by my blog. 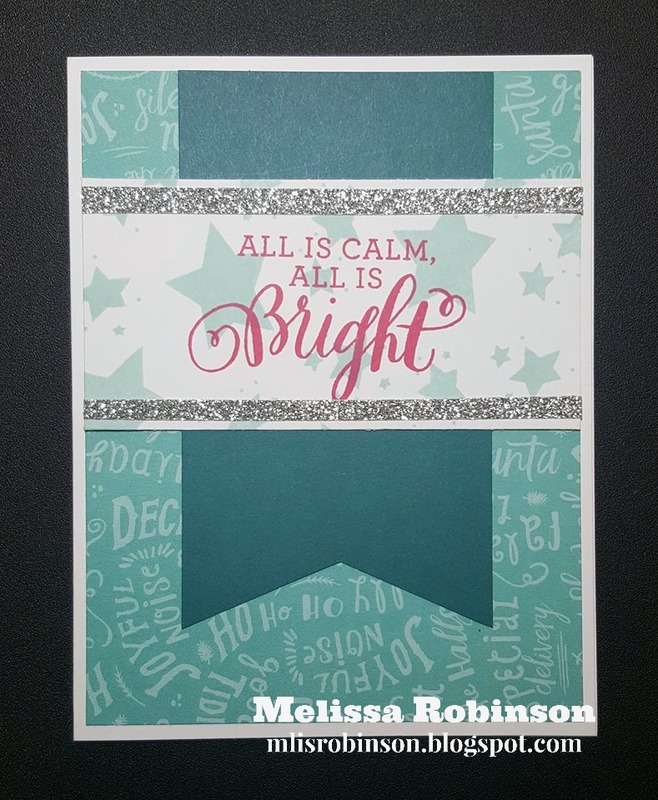 Head on over to Tonya's Blog to see what she created with this fun paper pack. 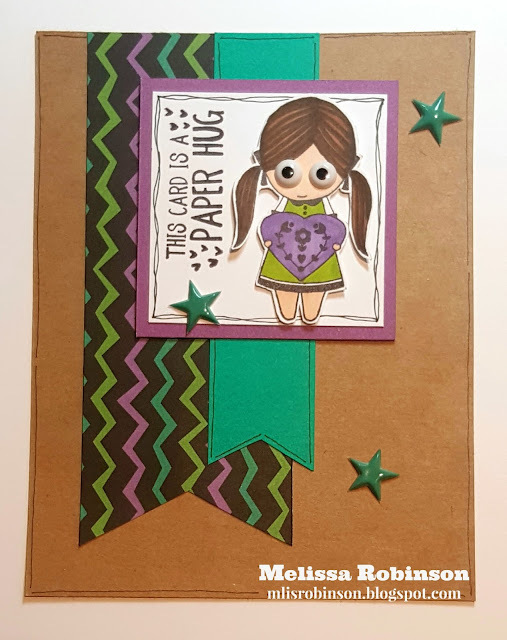 Happy National Stamping Month and thanks for joining us this week for the Heart 2 Heart Challenge that focuses on stamping! 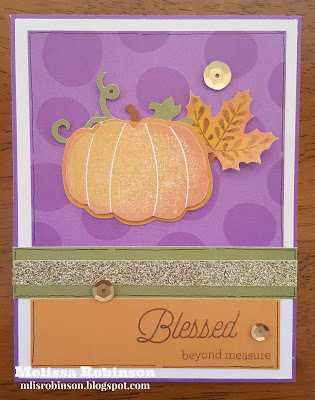 Incorporate stamping on your artwork, using Close To My Heart products and link up. I created this card using the September Stamp of the Month, "Blessed Beyond Measure". I stamped various images onto the Sea Glass piece of cardstock with Sea Glass. I love the subtle look that provides. Our clear stamps and acrylic blocks allow for accurate placement of your stamped images, time after time. 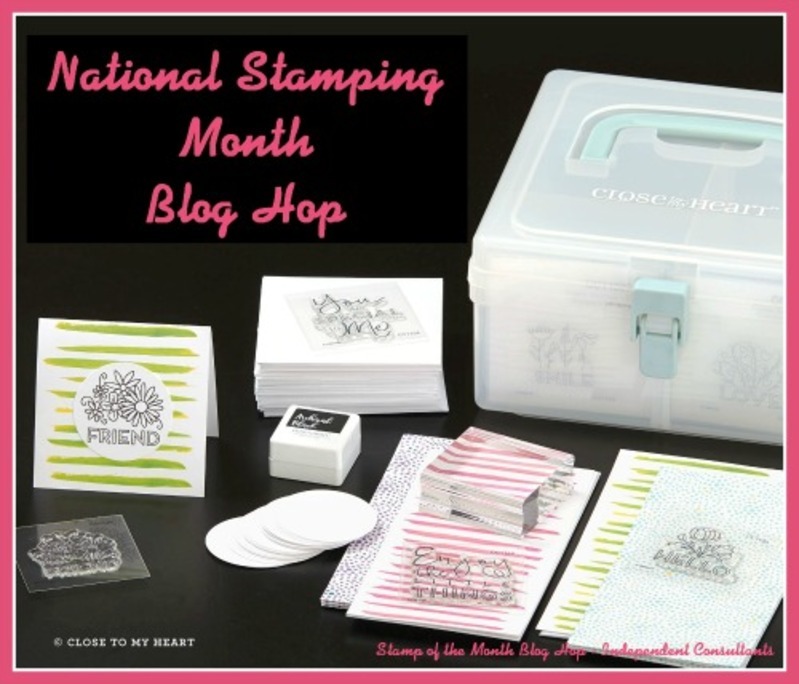 We look forward to seeing how you celebrate National Stamping Month, the Close To My Heart way! Have a blessed Labor Day holiday!